When I learned about the solar storm charging toward Earth last Tuesday, I wondered what effect these high frequency charged particles would have on our consciousness. The news stated this was the biggest storm in five years, with the additional storms reaching their peak in 2013. I did a little research on the web. Through our interconnectedness, everything effects everything else. This we know. While these particles can wreak havoc with the electro magnetic energy field of the Earth, causing disruptions in computer generated activities, there is a brighter side to this manifestation. The Mayan calendar ends in 2012, which could indicate a wave of a new consciousness of being. 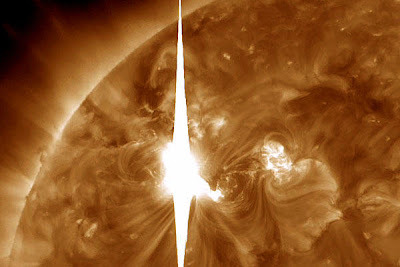 With the influx of solar activity, our personal electro magnetic field is also being transformed. This higher frequency helps create the power of instant manifestation of thoughts...whatever we think we create instantly. I've noticed how these energies create a magnification of issues that need healing, bringing them up to the surface to be addressed. If we are harboring anger, fear, jealousy, our energy fields can weaken during solar activity. God's thoughts passing to us, are His angels, guiding us to come up higher in our thinking. As we process our stuff, it is important to not get caught in the material illusion. Walk over it, but not in it or through it, making it more real than it is. The Holy Spirit's consciousness within you knows the Truth and will provide the translation into light when we still our minds and ask to see things differently. He will take every dark thought we share with Him and shine the Light on it, dispelling all the trouble. Love conquers everything. It is truly an exciting time to be alive, as I believe we are being birthed into a brand new way of being. So take the storms lightly as they come and be thankful that you're made perfect in the image and likeness of God, nothing can ever be added or taken away from the perfection that you are in Spirit.